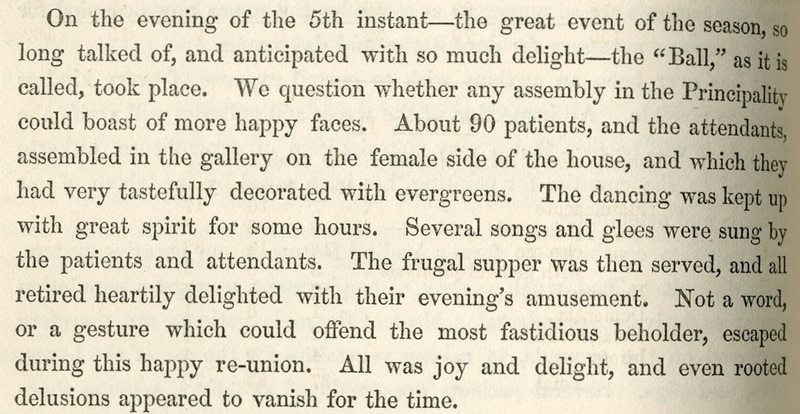 In their fourth annual report the medical officers report that ‘the great event of the season, so long talked of, and anticipated with so much delight – the “Ball” as it is called took place. We question whether any assembly in the Principality could boast of more happy faces. About 90 patients, and the attendants assembled in the gallery on the female side, and which they had tastefully decorated with evergreens. The dancing was kept up with great spirit for some hours. Several songs and glees were sung by the patients and attendants. The frugal supper was then served, and all retired heartily delighted with their evening’s amusement. Not a word, or a gesture which could offend the most fastidious beholder, escaped during this happy re-union. All was joy and delight, and even rooted delusion appeared to vanish for the time.’ Evidently these events offered patients the opportunity to exercise self-control, and thereby played an important role in re-socialization. During the war years ‘every effort was made to prevent the war affecting the recreation of the patients’ but as the annual report of 1941 states ‘it has been inevitable that it should do so to some extent. Owing to petrol rationing the distance from which entertainers could be drawn has been limited. Christmas, of course, was as cheery as ever and the patients had their Annual Ball on the 14th January’. 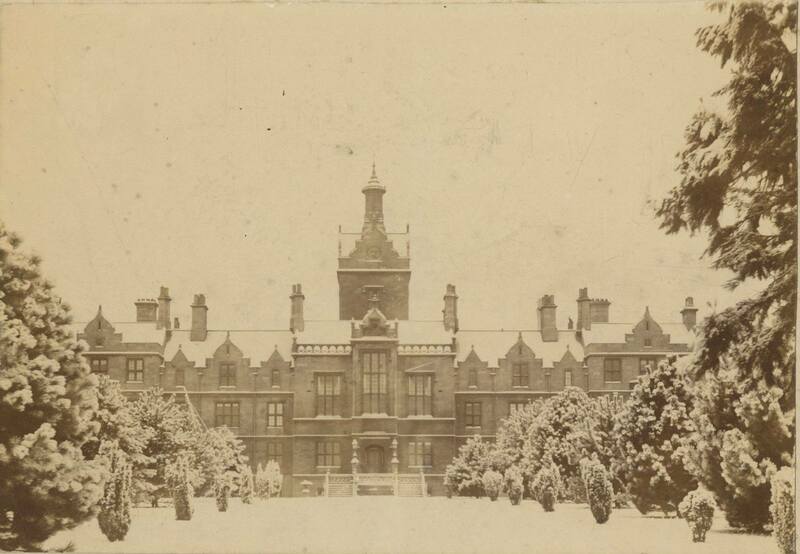 The Annual Ball was clearly the high point of the asylum calendar, and evidently remained so for well over a century, for the patients, the staff and the people of Denbigh. The ‘Unlocking the Asylum’ project team would to thank you all for your support during 2018, and wish you a Merry Christmas and a Happy New Year. This entry was posted on December 13, 2018 at 3:57 pm and is filed under Uncategorized. You can follow any responses to this entry through the RSS 2.0 feed. You can leave a response, or trackback from your own site. Local history of interest of us all. What charming and uplifting recollections, which will bring a lump to your throat and reminds us of what Christmas should be about.